Big and seemingly impossible jobs always tend to come Bill Young’s way. Young, vice president of engineering at Superior Energy Systems, receives requests from all over the world to design propane air blenders, propane peak-shaving plants and bulk terminals. Friends and colleagues say he often takes the projects no one else wants because the client is asking for something no one’s ever heard of. To date, no project or request has left him stumped. Throughout his 55-year career, Young has been involved in the design and installation of more than 2,000 propane fuel systems. He has also worked in many sectors of the propane industry, including retail and midstream markets. Many describe Young as a highly intelligent, God-fearing man. His detail-oriented mind and trusty calculator watch help him to plug through just about any engineering problem that comes his way. Even in his mid-70s, Young seldom takes a vacation. Like clockwork, he still goes to work at Superior from the first thing in the morning until the end of the workday. If Young happens to have downtime, he likes to hunt, spend time with family and read thick textbooks on just about any subject. Young attended Youngstown State University and the University of Pittsburgh where he studied a variety of subjects. He started with physics, then music and eventually chose engineering as his major. Although Young studied engineering in college, he received his first engineering lessons from his grandfather. During his college years, Young landed a summer job at Industrial Gases in Pittsburgh. The company designed industrial equipment that ran on propane. Young became a full-time employee there after college and helped to engineer a propane air blender for the company in 1962. He also assisted in converting forklift trucks to propane. Ugite Gas, which later became AmeriGas, acquired Industrial Gases shortly after Young’s tenure there began. 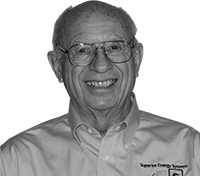 Young stayed with the company and applied his expertise as both a sales manager and director of engineering for specialty products from the mid-1960s through most of the 1970s. But as the years passed, Young missed the small-company feel of Industrial Gases that allowed him to focus on unique projects. So in 1977, Young left the company to serve as vice president of sales and engineering at Alternate Energy Systems, a manufacturer of propane vaporizers and propane and air-mixing equipment in Peachtree City, Georgia. Young left Ugite to do what he loved most: solve unsolvable problems for the propane industry. Throughout the latter half of his career, Young has served as an inventive mind at Alternate Energy Systems, Plant Systems and still today at Superior Energy Systems. Derek Rimko, vice president of sales and operations at Superior, notes how Young has performed industrial jobs all over the world, from “podunk” towns in the United States to Japan. With many international jobs came many plane rides. To lower travel costs and time spent at airports, Young earned his pilot’s license in the late 1970s. He often rented planes to fly directly to projects within the U.S.
Over the years, Young and his colleagues have worked on many project designs to help the industry, including peak propane shaving plants, high-pressure propane turbine systems and propane systems for firefighter training facilities. Projects involving firefighting facilities are among his favorites. While working at Superior in 2009, a company in Qatar asked for a firefighter training facility design. “That is possibly the largest firefighting facility ever produced,” Young says. The facility features about 70 flame effects and 26 propane vaporizers, all designed by Young and his team, he says. The facility will create an LP gas fire to help train first responders on how to put it out. The facility was completed two years ago. More recently, Young helped to design and build a propane vapor system for an Air Force base in North Dakota. This winter, he visited that site to help construct it despite 3 ft. of snow. Young also led the way in autogas conversions during his days at Alternate Energy Systems and Plant Systems, which became Superior Energy Systems. The companies performed “hundreds of conversions a year,” he says. Young stayed true to autogas outside of work, as he drove his own propane vehicle throughout the 1970s. Many in the industry also recognize Young for his steadfast commitment to safety standards and regulations. Young first joined the National Fire Protection Association (NFPA) in 1991, taking part in its NFPA 59 subcommittee. After attending just one meeting, the chairman asked Young to join the NFPA 58 committee and eventually a number of its subcommittees. Young is also involved in the National Propane Gas Association’s Technology, Standards & Safety Committee. For the past 25 years, Young has also lent his voice to NFPA and received awards for his dedication to safety. Young’s expertise in large construction, propane systems and installation has been particularly valuable to NFPA discussions, Hoffmann says. Hoffmann has always appreciated Young’s openness and honesty at meetings.